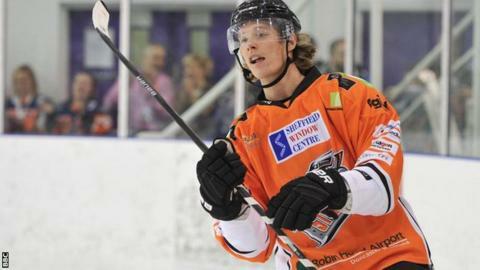 Belfast Giants have signed forward Mike Forney, the Elite League's top scorer last season with Sheffield Steelers. The 27-year-old American helped the Steelers to the 2015 title with 43 goals and 44 assists, good for 87 points in 69 matches. "Mike led our league in goals last season - something we were lacking," said Giants coach Steve Thornton. "He is strong on face-offs and was a first team All-Star in both the Elite League as well as the ECHL." He added: "Forney makes his line-mates better - helping make his line the best in last season's Elite League. "Mike is a game breaker and I am excited to have him in Belfast." Forney was drafted 80th overall in the 2006 NHL Draft by the Atlanta Thrashers and spent his time in college hockey with the University of North Dakota. He then played 253 games and posted 222 points overall in the ECHL for the Colorado Eagles, where he was named in the league's first All-Star team, and the Gwinnett Gladiators, linking up with Chris Higgins. Forney spent the 2013/14 season in Europe with Villacher of Austria as well as Norway's Sparta Sarpsborg before joining the Elite League in 2014.